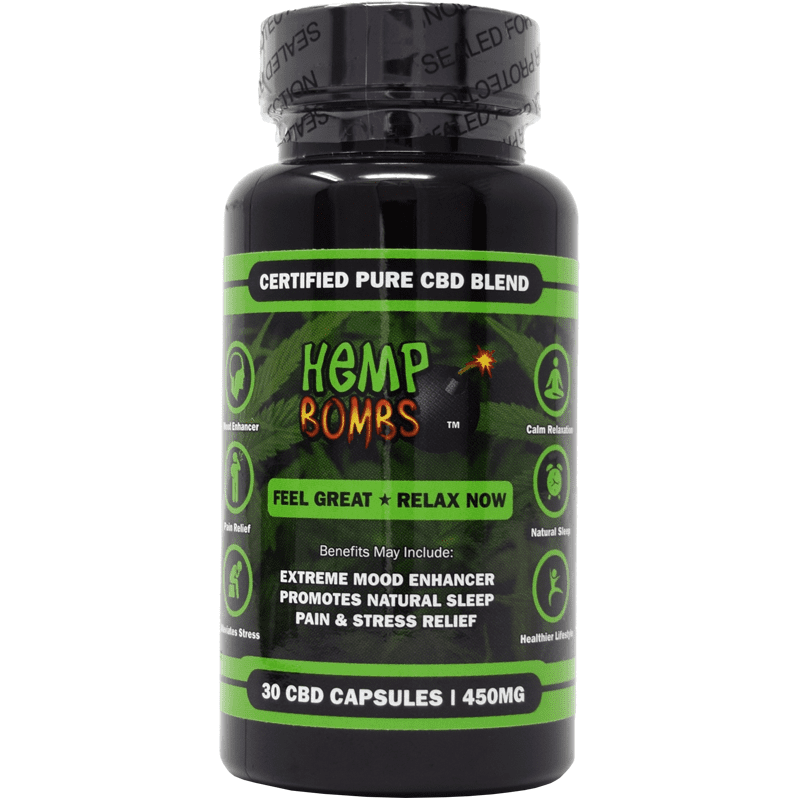 Hemp Bombs 5-count CBD Capsules are a premium blend of cannabidiol in an easily digestible capsule form. Our Capsules provide you with a mix of all-natural ingredients and therapeutic benefits that can positively impact your health. Taken in the morning or at night, our CBD Capsules have the potential to enhance your overall focus and help provide relief from pain, inflammation, anxiety, and sleep disorders. Yes, 5-count Hemp Bombs CBD Capsules are federally legal to sell, buy, and consume throughout the United States. Our pure CBD is sourced from Industrial Hemp and contains zero traces of THC. All our products undergo third-party lab tests to ensure they are pure and suitable for your overall health. 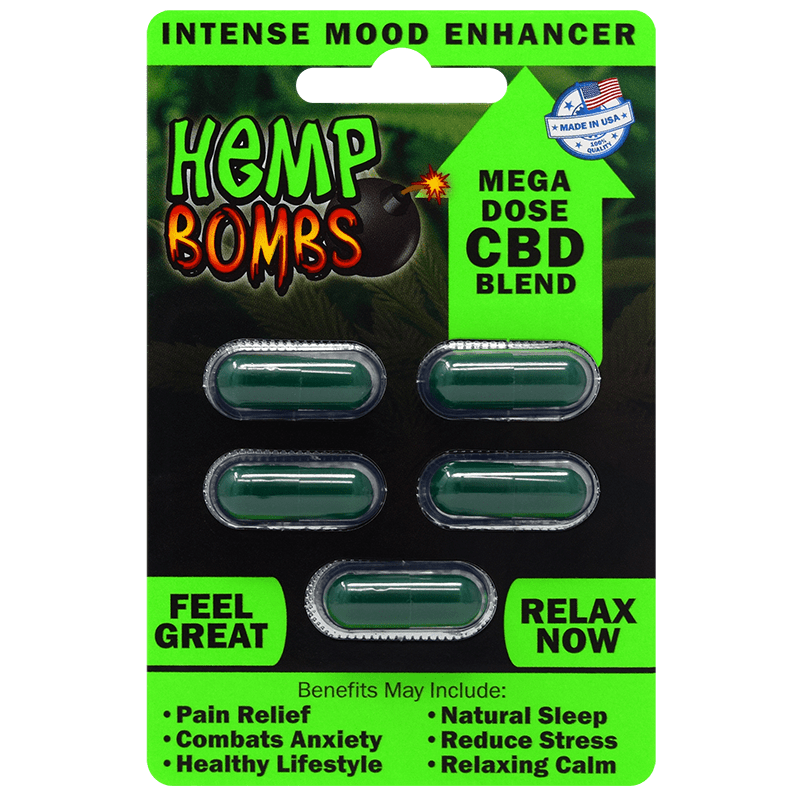 No, Hemp Bombs 5-count CBD Capsules will not get you high. The CBD used in our certified premium CBD Capsules is isolated. Isolate CBD is 99% pure and contains zero traces of the psychoactive cannabinoid, THC. Consuming our CBD Capsules will produce a relaxing calm instead of a “high” that THC produces. I took these to a bachelorette party – any time someone was nauseous, foggy, not feeling well I would give them a capsule and within 30-45 minutes all their hangover symptoms would be gone.. including anxiety! They help me deal with my anxiety and depression. I can feel them working after only a few minutes. My mood improved and my joints have less pain and stiffness. I think this cbd stuff works! set and allowed me time to cruise the dreams and experiences. I am very impressed. I tried these at a convenient store last week. I was surprised how relaxed they made me feel. May buy more. My mom she is 70 years old. Long story short she was in pain for a long time. She was always complaining about her pain. Head. Feet. And much more . and not enough sleep at night. . Finally i decide to give her hemp bomb. I give her only 1 cap every night before her bedtime. After one hour i make her a banana juice with milk and almond . she seems like she gets her good sleep at night. And no complaints about her pain. She is more Vocus .she is n a better mood. I just want to thank the hemp bomb . u are a life saver. I would like to know about the capsules the are natural like gelatin or plastic. Ever since they took out the Phenibut these haven’t been the same. Will not be purchasing again. Bought these on a whim one day at a gas station I got to every day. I started with the gummies, they were ok. Then I decided on the capsules. For whatever reason they are SO much better for me. They help my constant pain and my anxiety. They also help me sleep. I need to order a bottle!! I appreciate everything your company does! Thank you so very much for these products! Can’t wait to try the vape juices!! Had no clue you all made them!! I’m a strong believer in this overall. I’ve tried cbd in many forms and HB is by far the best of them all! Thank you! All it did was make me sleepy all day. I’m not in love with the price but honestly hands down best product ever! As a retired veteran with fibromyalgia, PTSD, and a long list of other chronic pain issues I’ve been on the search for an alternative to pain pills. 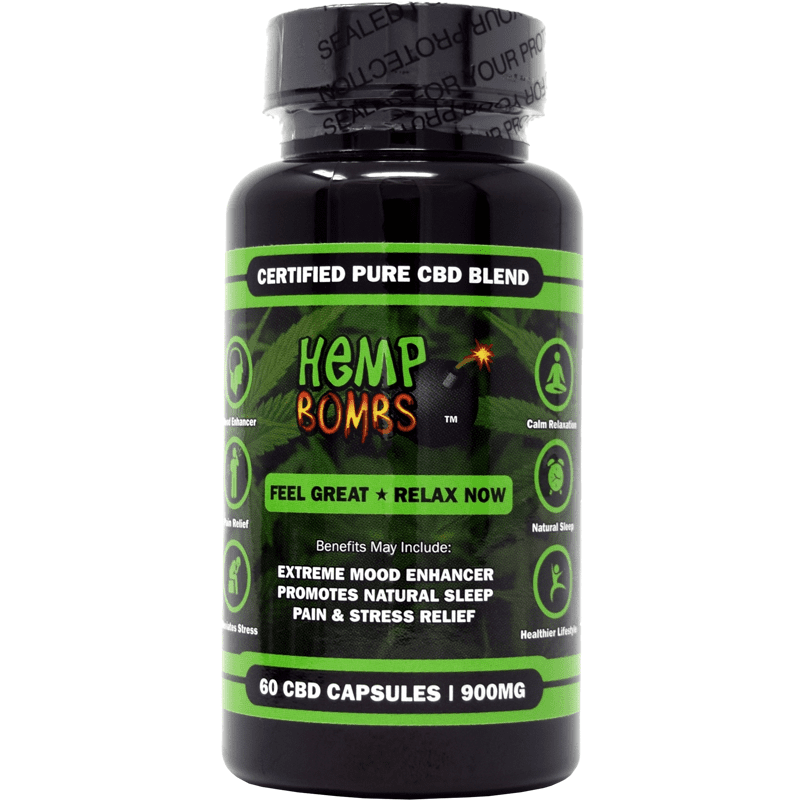 Hemp bombs products have by far surpassed the lengthy list of everything else I’ve tried. My ONLY other criticism would be they need FASTER shipping options. I look forward to being a regular customer for both capsules and vape needs. 5-Stars for sure! The capsules are my favorite CBD product. I’ve tried tons of other brands but nothing seems even close to these. I’m happy with my capsules. A little pricey for just a sample size but luckily I found a good coupon. This is great for reducing anxiety and helping me sleep so much better. Am a twice wounded disabled vet from Vietnam era. Lots of pain and doc wants to cut back on meds. After trying the capsules, I found they helped a lot with pain and anxiety from wounds. Good Product………keep formulation same!! I was curious about CBD so I decided to try these for the pain in my legs. I worked a horrible retail job where I got injured and messed up my legs. These pills really ease the pain my legs and makes me feel so relaxed. I’m going to buy again but a higher count. I bought this for my sister who has been struggling with overwhelming anxiety since she lost her job. Since taking these caps she has been more calm and able to deal with stress throughout the day. First time CBD user and choosing this as my first product to start with is the best decision of my life. Not sure where where I’d be without them! I am concerned I’ll get hooked on these like sleeping pills. Can this happen? Your capsules are good! Like them a lot. Glad I decided to try these. They really do work. These are def worth the cash. Work great! David, yes, that is phenibut and that is an outdated version. We have since had it removed from our products. 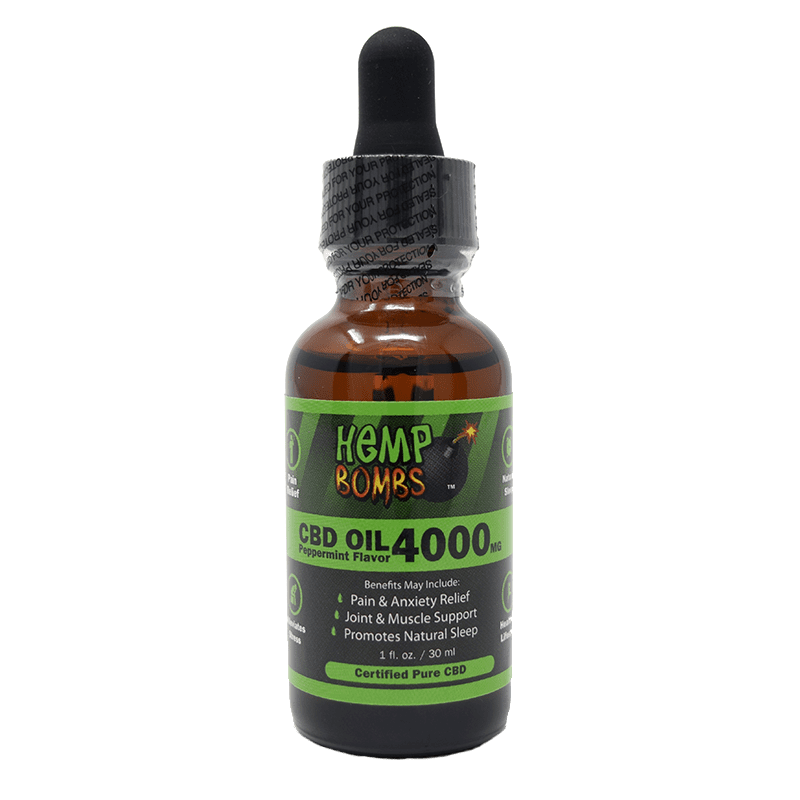 The cbd wouldn’t account for over 50% or higher, but nor would any of the other ingredients. The products sold online will not contain Phenibut. Just to let you guys know, I’ve been taking your capsules for two weeks and I am seeing improvement in both my sleep and a reduction in my anxiety. I am a handicapped person and tried these for pain. Amazingly, the cbd capsules worked. I got the card of 5 capsules at a vape shop and liked them. Just bought a bottle of the 60 capsules. Thanks. Of all the Hemp Bombs products I’ve tried and that’s about four or five, I like the capsules the best. 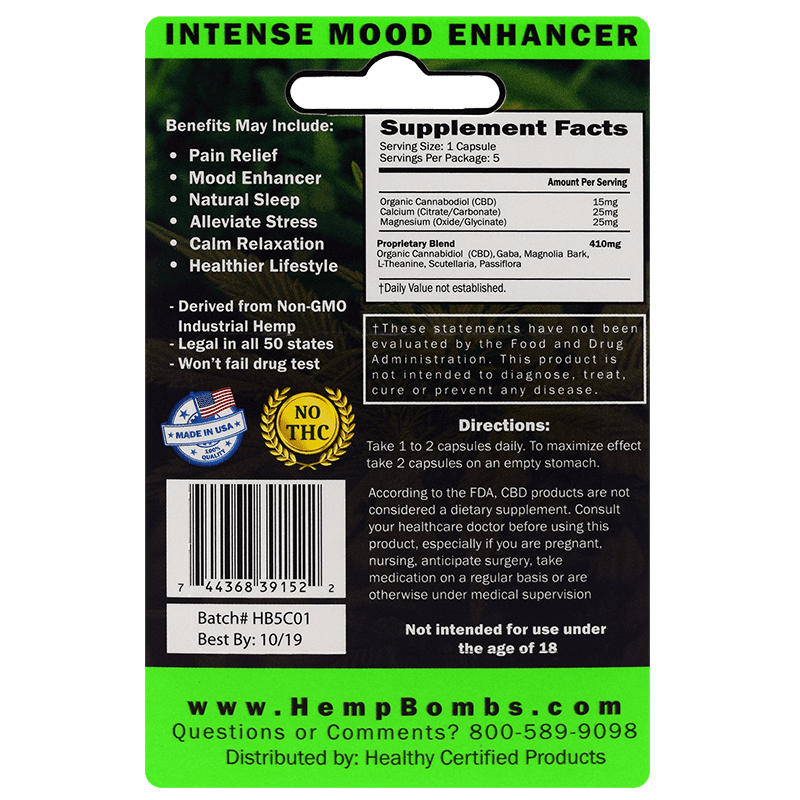 Does this product contain phenibut ? None of our products contain phenibut. Bought the 5-pack of capsules at a smoke shop near me last week. Really liked everything about it. The feeling, the graphics, the logo. So I did some homework on Hemp Bombs. You guys are the real deal. I just ordered a bottle of the capsules. I like your company. I’m a long time cbd oil user. I can’t believe I’m just finding out about these capsules and about Hemp Bombs. Where have you guys been? After trying the gummies I gave the capsules a whirl. I find that these work even better for me then the gummies. I dont understand why I pay less for this in the shop around the corner than what you sell for here??? Love this product. It did exactly as expected. I use it every day. I decided to buy this product because their extraction method was recommended based on the research, heir products are a godsend and I wont buy from anywhere else now. The shipping is lightning fast and customer service is phenomenal. I’ve had arthritis for 20 years and had just been dealing with it. I thought I’d give cbd a try and to my amazement it is a little better. I’m going to buy a bottle of the capsules tonight. This packet is cheaper at my smoke shop, but they don’t offer the bigg bottles so I come here to get them. The little packet is where it all started for me. good product yall. Was worried about failing a drug test while taking these, but the customer service person eased my fears and I’m enjoying the benefits without worry now! My boyfriend insisted on buying these when we drove to Rhode Island a fwe weeks ago. Didn’t make that trip any less stressful for me if anything it made my anxiety worse. When I finally could fall asleep, I did sleep like an old man though. Bought these for my brother who suffers from epilepsy. thanks for a product that can bring some relief. We tried the four pill pack. And it worked great so we decided to get the 15 pill bottle and to our dismay the strength was different so now we are hoping to talk with a real person to see about getting the right pill in greater quantities.. Thank you for your review and question. The capsules in the 4-Pack are the same capsules that are in the bottles, with the same ingredients and potency. Purchased the capsules to help with my DDD, digenerative disc disease. It’s so bad it keeps me from sleeping. The capsules help the pain a little and at least I can sleep through the night without waking up 10 times. And, I like that they don’t have side affects like other pain and sleep pills. I was using Biofreeze for muscle pain in my knees. A co-worker suggested I try your Hemp Bombs capsules as he swears by them. Well, I’m finding they DO WORK for lessening my knee pain and they make me feel nice and relaxed. Wasn’t expecting that but it’s ok. These helped me out so much I’ve gone on to the 30 capsule bottle. Thank you for a great pain-relieving Hemp product I can take and not have to worry about getting fired due to a failed drug test. Helps me sleep better for sure. Used one every night this week. I have severe joint pain in my right elbow from years of playing tennis. I’ve tried a LOT of different medicine for the pain. These gave me a little bit of relief, but wore off pretty quickly. My brother turned me onto your cbd pills. They really help with my mood swings. They consistently make me feel at ease and in control when things start to get out of hand. Thank you Hemp Bombs for this product. Is it ok to take two at a time? Was pleased with the feeling from each pill. I definitely felt it. Took one every day and like what they do. Curious, how does the potency of a capsule compare to a single gummie? Same? They really help me with stress and I like that I don’t have to worry about failing a drug test at work taking these. Seems to help with my leg pain, but need more time taking them to be sure. Time will tell. I’ve tried a lot of different cbd brands and I gotta say Hemp Bombs kills. You must be using some high grade hemp. I’m a repeat customer now. This is my first review of any Hemp Bombs products. I was skeptical, but they do work. Maybe you put more CBD in yours? Five stars. I tried a small pack to see if these worked and boy they do. I’ll be sure to order a bigger bottle next time.